The boost in receipts narrowed the U.S. budget deficit for the previous 12 months to $460 billion, from $510 billion in March and $499 billion in the prior year. It was the lowest annual deficit since last November and the second lowest since September 2008. Over the past 12 months, revenues are running 9% above their year-earlier level while spending is running 7% higher. The figures illustrate how, despite growing unease over income inequality, the taxes that America’s rich are paying on their rising incomes are yielding a windfall for the U.S. Treasury. Payroll taxes rose 6% from a year earlier in April, while other individual taxes, including those on capital gains and self-employment incomes, were up 18%. via U.S. Posts Biggest Monthly Budget Surplus in Seven Years – WSJ. If the question is “How do we deal with massive deficits?”, the answer now shown to be a resoundingly good one, “Raise taxes on the wealthy”. We’ve got quite a bit more room to go on both of these before the problem is solved, as it were, but we know now this is a solid strategy. But here’s one important fact that Texas’ conservative and libertarian boosters reliably fail to mention (perhaps because they don’t know it): If you’re not rich, Texas is not actually a low-tax state. In fact, most Texans pay more taxes than most Californians. That seems strange and incorrect at first — Texas doesn’t even have an income tax! — but it’s true. Thanks to sales and property taxes, Texas is among the states with the ten most regressive tax systems. Texans in the bottom 60 percent of income distribution all pay higher effective tax rates than their Californian counterparts. Texas’ top one-percent are the ones enjoying the supposed low-tax utopia, paying an effective rate of 3.2 percent. The rate for the lowest 20 percent is 12.6 percent. Kevin Drum has a helpful chart. via The “Texas Miracle” fraud: Turns out it involves taxing the poor to help the rich get richer – Salon.com. This is why many very rich Texans have hundred of millions to piss away on politicians, they don’t pay that money in Taxes. We also see the regressive tax situation hit reality in the toll road expansion. Because the wealthy can pay less in taxes than they pay in political donations, everyone else has to pay for the highways. This means a net cash flow out of Texas, on an ongoing basis, and adds to the costs incurred by workers while saving businesses money. Which is to say…exactly what the article does. Seriously, go look at the tax rates and job creation in the 90’s . Compare it to the aughts, and then stop repeating blatant lies without calling them out. So I’ve mentioned before I’ve been following the debt limit discussions currently going on in Washington. They came to a halt last Friday after Eric Cantor (R-VA) deciding that constantly saying that taxes SIMPLY CANNOT be part of the solution to government debt wasn’t working and everyone kept asking him to be more realistic. That was never going to happen. His departure from the “debt commission” was planned. GOP aides and lawmakers said House Majority Leader Eric Cantor’s (R-Va.) decision to exit debt talks led by Vice President Biden was inevitable. The timing of Cantor’s exit from the talks has been discussed for weeks, and senior House Republicans cast it as a natural progression for the negotiations. “There have been discussions about when these talks need to end and when the Speaker and the president need to get in the game,” one GOP aide explained. What’s wild about this is that Cantor is now using the economic troubles caused by running huge deficits (created by tax cuts) and a war (paid for with…tax cuts) and lax regulation, as an argument against raising any government revenue. The doublespeak here is off the charts. Luckily there are a couple honest Republicans out there to try and balance out this stuff. Well, former Republicans. So it takes old people who have seen the errors of their ways to make the obvious point to the oblivious masses, old people like Reagan’s budget guy. The sickest thing here…if Obama hadn’t given in to the hostage takers last December…we wouldn’t be having this “crisis” or this discussion. 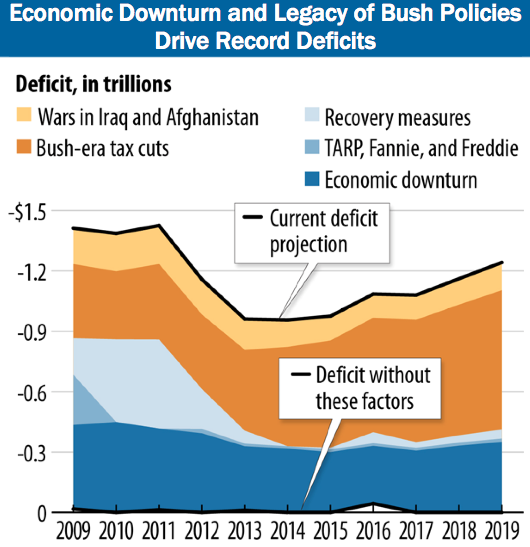 The Bush Tax Cuts would be gone, and we’d be back on the path to fiscal sanity. What’s even more wild is that about half of *actual* Republicans are rational enough to understand the governments can raise taxes to pay down government debt. On tackling the deficit, voters by a margin of 2-to-1 support raising taxes on incomes above $250,000, with 64 percent in favor and 33 percent opposed. Independents supported higher taxes on the wealthy by 63-34 percent; Democrats by 83-15 percent; and Republicans opposed by 43-54 percent. This is the disconnect, BTW. Four out of ten *actual Republicans* understand how low taxes are right now, and that they can be used by governments to pay down debt. But when you get to Republican leadership, the support for any kind of taxes at all drops directly to 0%. None of the current ones can break ranks without serious campaign funding repercussions. If you don’t understand why this is, you don’t understand how campaign finance reforms have made the Republicans a party that represents the interests of 1% of the population, but is able to use their wealth to buy 50% (and sometimes more) of the government. Sit it on this meeting to find out how that works. UPDATE: Icing on the d-bag cake…Cantor is invested in a fund that does great if the U.S. defaults. According to his latest financial disclosure statement, which covers the year 2010 and has been publicly available since this spring, Cantor still has up to $15,000 in the same fund. Contacted by Salon this week, Cantor’s office gave no indication that the Virginia Republican, who has played a leading role in the debt ceiling negotiations, has divested himself of these holdings since his last filing. Unless an agreement can be reached, the U.S. could begin defaulting on its debt payments on Aug. 2. If that happens and Cantor is still invested in the fund, the value of his holdings would skyrocket. I think we can all rest happy knowing that if the U.S. defaults on their debt, Eric Cantor will do just fine. Heck, the fund is up 3.3 percent just since he quit last week. I’ll let this guy speak for his own self. Couple other links on the topic…these are largely the symptoms of the above phenomenon. Here’s some general background reading on the changes happening during the period ranted about. Remember how Wisconsin was broke and teachers needed to take a pay and rights cut to balance the budget? Yea…turns out that money was just needed by folks more supportive of the Governor. Remember how people used to take vacations? Yea, me neither. But it turns out they do, in other countries. Working more makes Americans happier than Europeans, according to a study published recently in the Journal of Happiness Studies. That may be because Americans believe more than Europeans do that hard work is associated with success, wrote Adam Okulicz-Kozaryn, the study’s author and an assistant professor at the University of Texas at Dallas. “Americans maximize their… [happiness] by working, and Europeans maximize their [happiness] through leisure,” he found. So despite research documenting the health and productivity benefits of taking time off, a long vacation can be undesirable, scary, unrealistic or just plain impossible for many U.S. workers. BTW, that concept that hard work is what it takes to change your stars and it’s easier to do in the U.S. that anywhere else? Yea…not so much. The results are quite spectacular. Figure 3 shows that while in the Nordic countries and the UK, men born in the lowest income quintile (the income quintile of the father) have a probability of 25-30% to stay in this lowest quintile; in the US, this probability is more than 40%. Figure 4 shows that the probability of US men born in the lowest quintile to move to the top quintile is less than 8%, while in the Nordic countries and the UK, this percentage is around 12%. In the first emergency step, Treasury on Friday will stop issuing state and local government series securities, commonly known as SLGS. That could make it harder for states and cities to issue debt, because they will have to seek issuers in the private market. If the debt limit hasn’t been raised by May 16, the government will begin delaying payments into two government pension funds and redeeming Treasury securities in those funds. It also will suspend its daily investment of Treasury securities into another government employees’ retirement plan. In addition, Treasury officials are prepared to suspend their daily reinvestment of Treasury securities held as investments in the Exchange Stabilization Fund, a fund held by the government to guard against exchange-rate fluctuations. As the Treasury department has been warning — and as House Republican leaders have promised — the United States hit its debt limit Monday morning. The government can no longer meet its obligations by borrowing more money. And since incoming revenues aren’t sufficient to pay for the services Congress has ordered and for interest payments on existing debt, the Treasury department is taking a series of ever-more extraordinary measures to pay all of its bills. This was as threatened by the Derp Brigade (also known as the Tea Party). They believe that by simply not paying for our obligations, we won’t have them any more. These folks have convinced themselves that the lowest tax rate in their lifetime is the highest tax rate in the history of the Universe, and the only way to make that point is not to pay down the debt DRIVEN UP BY THAT SAME RATE. It’s so ridiculous at this point, but I’ve got about six or seven posts to make about this. We had a balanced budget 12 years ago. We paid down some debt. We then cut taxes and were told that would help pay it down more. The debt got larger. We cut taxes more. We went to war. The debt got larger. We cut taxes more. Now the debt is huge…and what’s the Republican plan? Don’t pay the debt we do owe, and cut taxes more. All the while one of their mouth is saying “all options are on the table” to deal with the debt, and the other side screaming, “EXCEPT FOR TAXES!!!”. When you have have one-half of government refusing to consider the concept of “taxes” being used to pay for “government debt”, you know how crazy we’ve become. And hopefully now everyone can see how bass-ackwward tea-rarded certain groups of political activists have been shown to be. Nice rundown here of the federal budge and how your tax dollars are spent. I liked how they were able to embed the videos into the document as well. It looks like Silverlight is making some application-level progress. UPDATE: I was thinking more about why I like this chart so much and I realized it’s because of the way that it compares information in proportional circles. I think this is probably one of the best ways to graphically convey scale and easily allow comparisons. Sometimes it is difficult to know, instinctively for most people, the difference between a million and a billion, but seeing the difference between a circle the size of a basketball (9.39 in.) one big enough to fill the gap in the Lackawanna Valley Bridge (800 ft.) and it quickly become apparent to everyone what 1000X actually means. Now if you take that basketball up to a trillion times (in American english, 1000 billion, in English english a “billion” or a million million) and you have to draw a circle around most of the cool parts of Southern California (18,000 sq. mi.). So if you think of that basketball as a dollar, think of having to set up enough basketballs to fille up a circle 18,000 sq. ki. across to think of a trillion dollars. That’s about how much we spend. You can see that in the chart above (which needs a handy real world comparison as well). Oh, and can someone check my math.